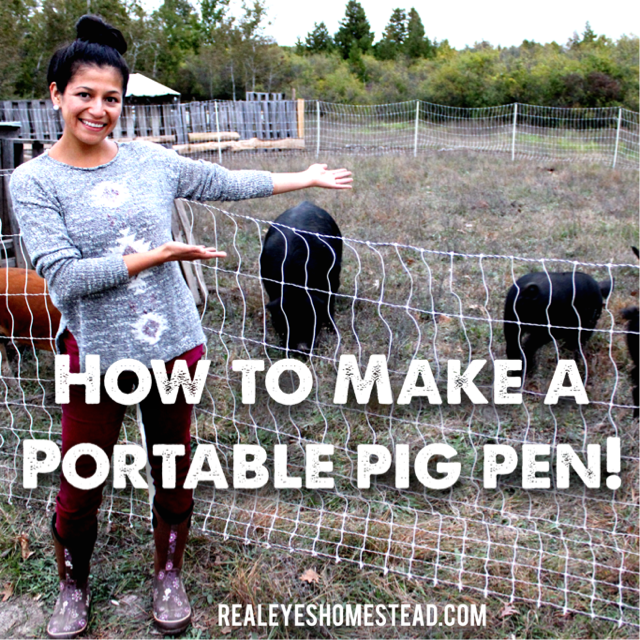 Two years ago, Brenda and I were renting an apartment and I would commute to the farm every day to take care of our pigs, chickens, gardens and plant nursery. This situation quickly made it clear to me how important it is to actually be LIVING on the land you’re farming. This is because farming is really a lifestyle more than it is a job that you can just leave when you’re done. It makes demands of you that no job ever would. 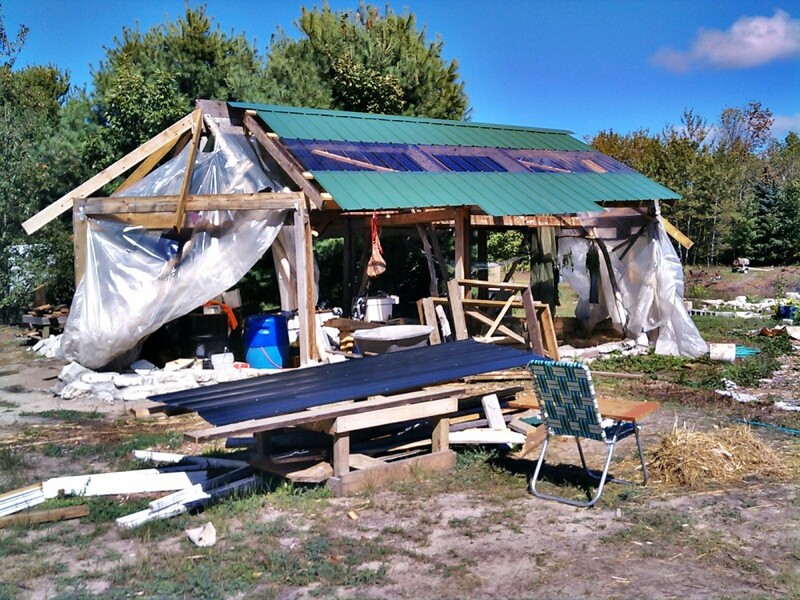 This was the beginning of our strawbale passive solar greenhouse adventure. The problem was, there were no permanent structures on the parcel of family land that we were managing. We were starting, literally, from scratch. Thus began our long quest to procure SHELTER. Lacking much of any building experience, my first attempt was to build an A-frame sort of thing with salvaged lumber and logs. This housed my aquaponics system, as well as a sleeping loft up above. 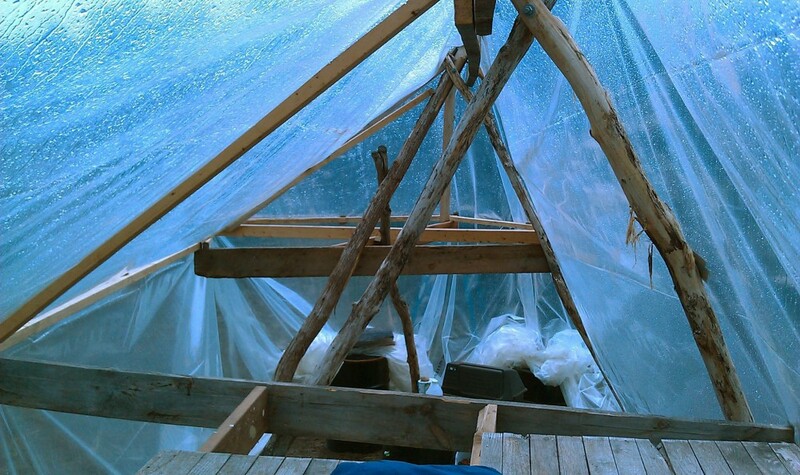 Next, I bought a huge sheet of greenhouse plastic to throw over this hodge-podge structure. Yeah that worked….not so much. Lacking much actual construction experience, and driven mostly by my blind faith in these innovative alternative technology ideas I discovered online, it was no wonder the thing failed miserably. 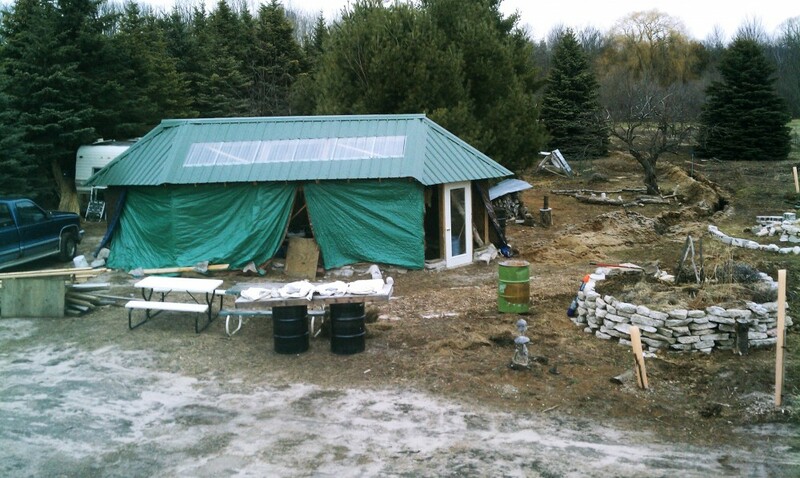 Ultimately the water tanks weren’t near enough to keep it warm through the winter, and the aquaponics system, and thermal mass barrels all froze up. Also a bunch of holes tore in the plastic, as the wind whipped it against the many edged wooden frame. And so ended the maiden voyage of spaceship head. 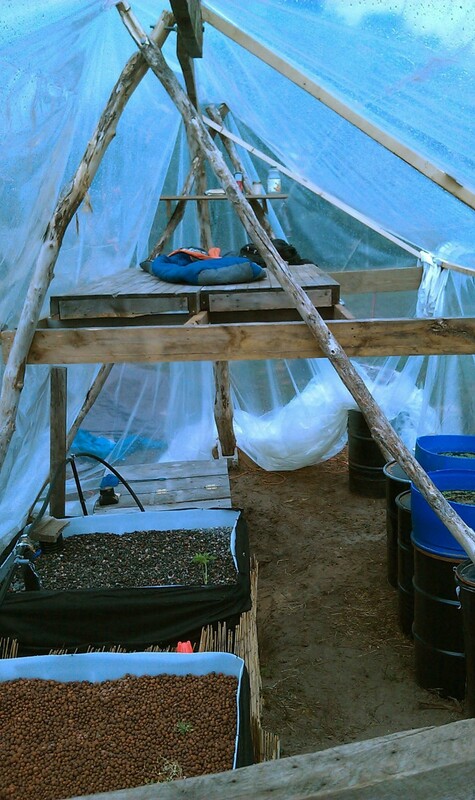 It’s very important that the hoophouse frame doesn’t have sharp corners over which the plastic is stretched. Construction is a skill that takes years of knowledge and experience to develop. It’s best to start with a small project and find a mentor to learn from. Just because I don’t want to do things “Conventionally” doesn’t mean that conventional builders don’t have a lot of useful expertise that can be applied to natural building. Having faith that “The universe will be there to assure my success” isn’t always the most reliable approach. Perhaps the universe needed to teach me some hard lessons this time. Perhaps Aquaponics is not the best way to grow food when I have acres of land to work with. That was a LOT of feedback, but I definitely needed it, and it helped me find the better path in all my future projects and endeavors. 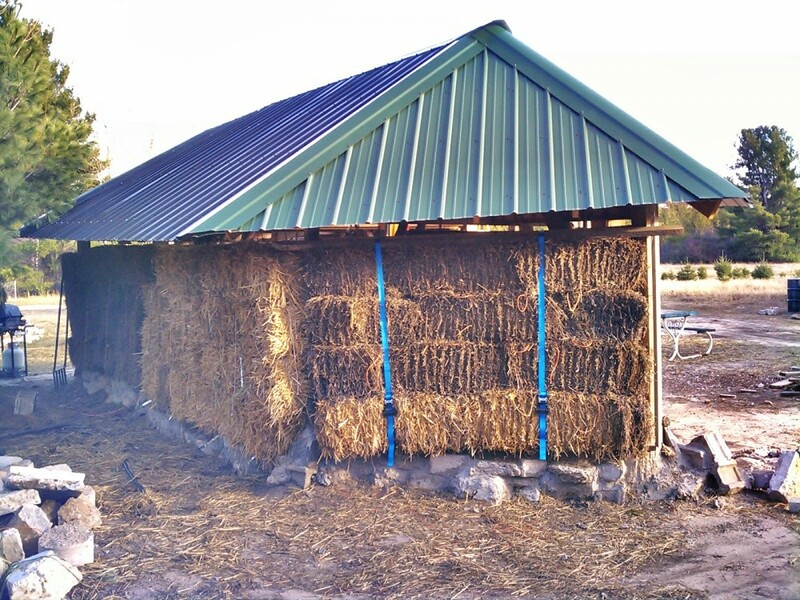 The first step was to put a real roof on the structure so that once we start putting in the strawbales, they are protected from the rain. This involved mostly my dad teaching me every step of the way to install a steel roof. That process wasn’t easy because the frame’s shape and dimensions were all wonky. When I built it, I didn’t believe in the oppressive influence of measuring tapes and squares. But while trying to install the roof panels I definitely did a 180 on that idea pretty quick! Once again, the unusual shape of the structure made this process take MUCH longer than it should have. But I was determined! And I had a lot of help from friends like Jonathan Aylward and Devin O’dweyer who came out to help during that time. I think it sat through another winter with most of the strawbales in the walls and the roof on. 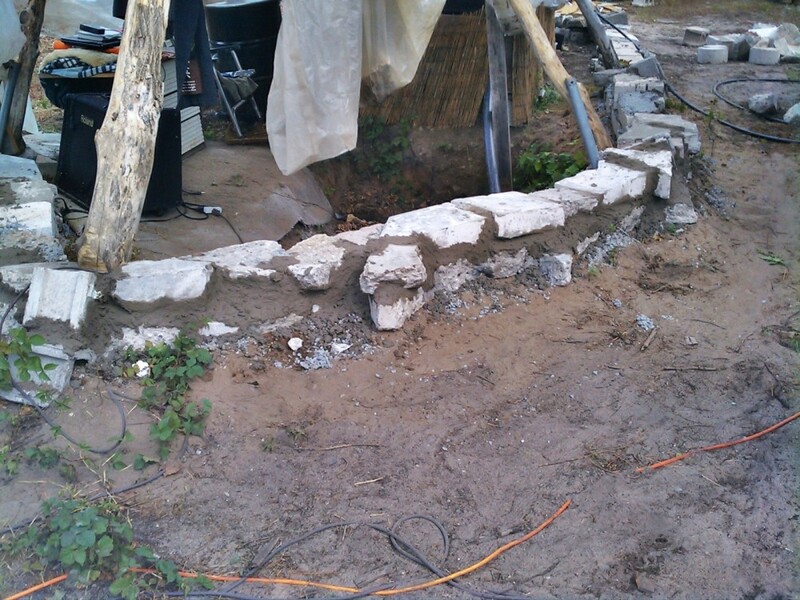 (I put tarps over the strawbale walls to protect them from the elements) Then during the spring of 2015 we finished filling the walls, and began figuring out how to cover the walls in earth plaster. Once again I leaned heavily on the expertise of Thomas Hirsch. That summer and fall we planned a few earth plaster workshops to both help introduce our friends to the concept and practice of natural plasters, as well as make some progress on the strawbale greenhouse. Thomas generously agreed to come out and lead the workshop. 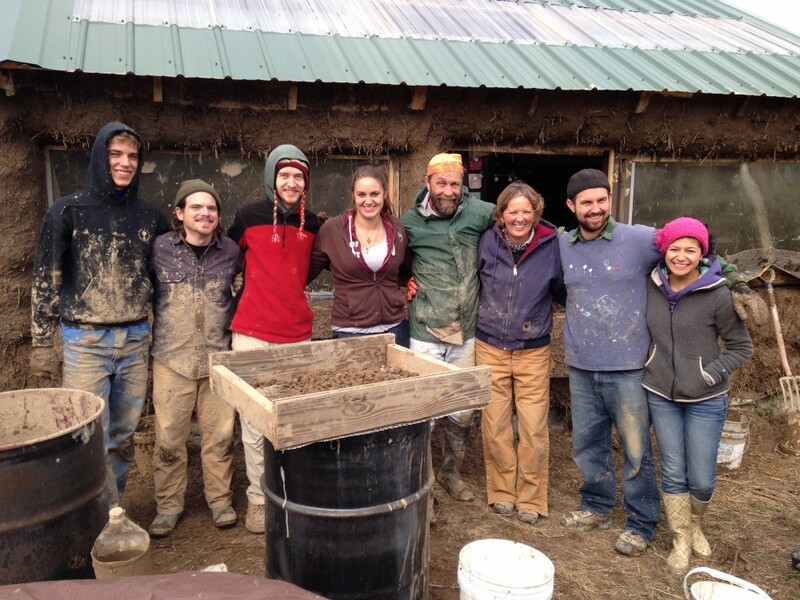 A great crew of 8 or so friends came out and we worked away laying down the first and second coats on the exterior of the strawbale walls. BIG LESSON: Basically the problem with haybales for walls is that they have feed value, so they will attract mice, rabbits etc to come and eat the insides of your walls out. Hay is dried out grass that is used to feed horses. Straw is the leftover stalks from grain crops like wheat, and it’s used for bedding. Hay is higher in nitrogen, straw is higher in carbon. Hay is flat grass blades, straw is a bunch of hollow tubes, like “straws!” These hollow tubes make it much better as insulation than simply the flat blades of hay. After we all had a good long laugh about this critical mistake, we got back to work with the plaster because, hay! Why stop now? 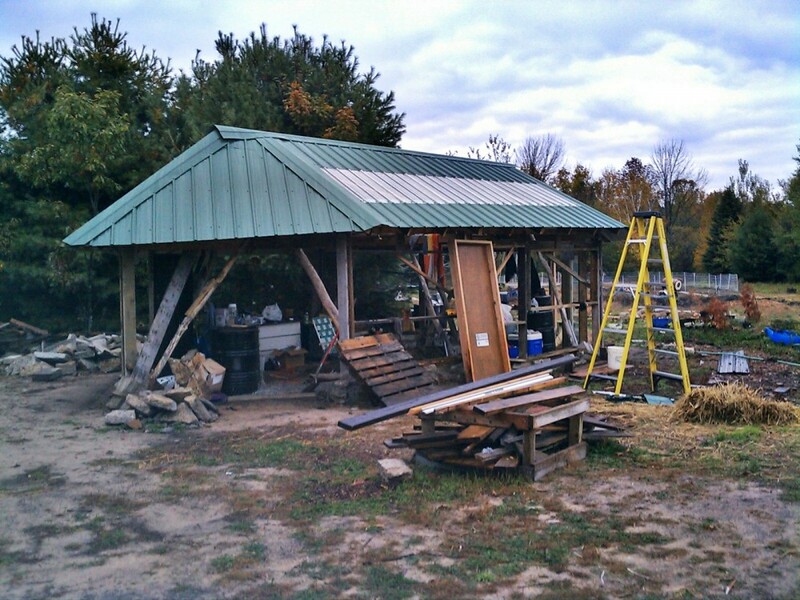 After numerous weeks, and several work parties working on the earth plaster we STILL hadn’t finished the FIRST COAT on the EXTERIOR of the greenhouse. AND we still had the whole backside and interior to do as well. THREE COATS TOTAL! So that fall, it began to dawn on me just how labor intensive some of these natural building techniques are. WOW. It is NO JOKE. The thing was, not only did it take longer to simply apply the plaster to the wall than it would to cover it with siding, there was also this whole other process of mixing the plaster. At least half our energy went into preparing the plaster mix. This included pushing the clay through a metal mesh screen to remove stones, then soaking the clay in water, then mixing it into a clay-slurry. NEXT we had to sift stones out of sand and add the sand to the clay slurry. THEN we had to use a leaf-vac mulcher to chop straw into little pieces, and add that chopped straw to the mix, stir it up really well, and get the consistency right. THEN finally it was ready to go on the walls. Granted, the work was done mostly with friends during warm weather on nice days, so it was mostly a joyful experience. However, it would be difficult to keep coming together day after day to get the work done. Most of us have day jobs and families, and our own projects to attend to. Coordinating one or two days that work for everyone was already a challenge. It makes a big difference when you use conventional building materials that are prefabricated in conveniently sized pieces that fit together like puzzle pieces, and are often pre-painted as well. That’s why conventional buildings can be built so quickly. Much of the work is done off-site in factories that create the materials. 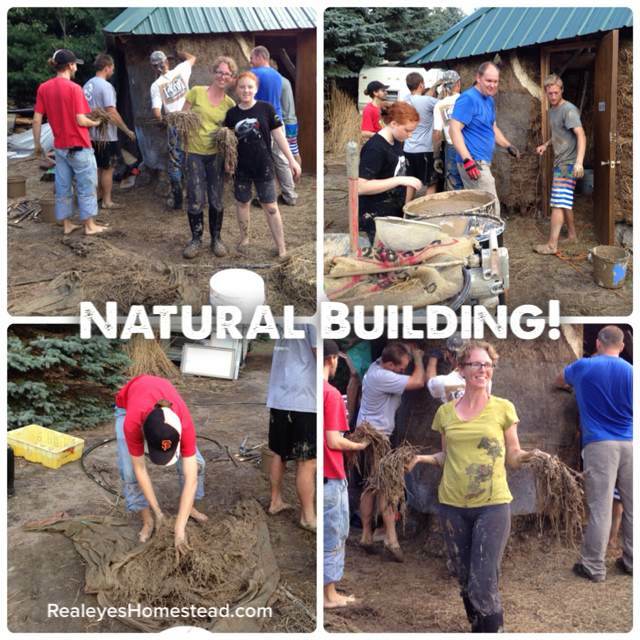 The Natural Building approach is more DIY. We often start with raw materials like clay, sand, straw, and stone, and have to process and prepare them before building the structure. So in a sense we are moving ourselves backwards in the supply chain, or in other words we are taking on a bigger role in the resource supply lines ourselves. This clearly has pros and cons. The big plus is that then we can ensure these processes are done responsibly. 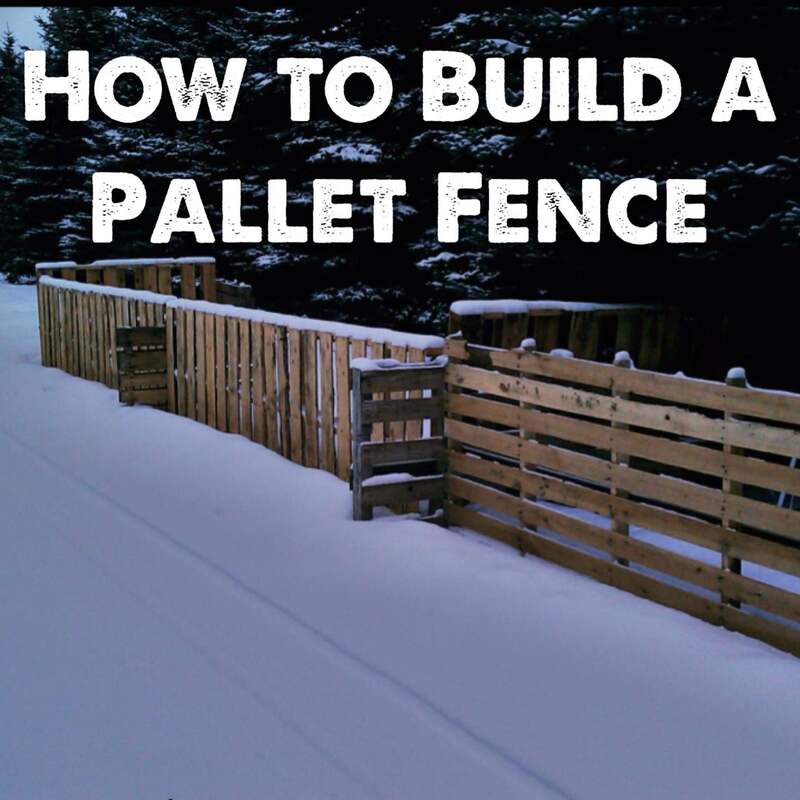 But the obvious downside is the extra tools, materials, and labor it takes to do this extra work. 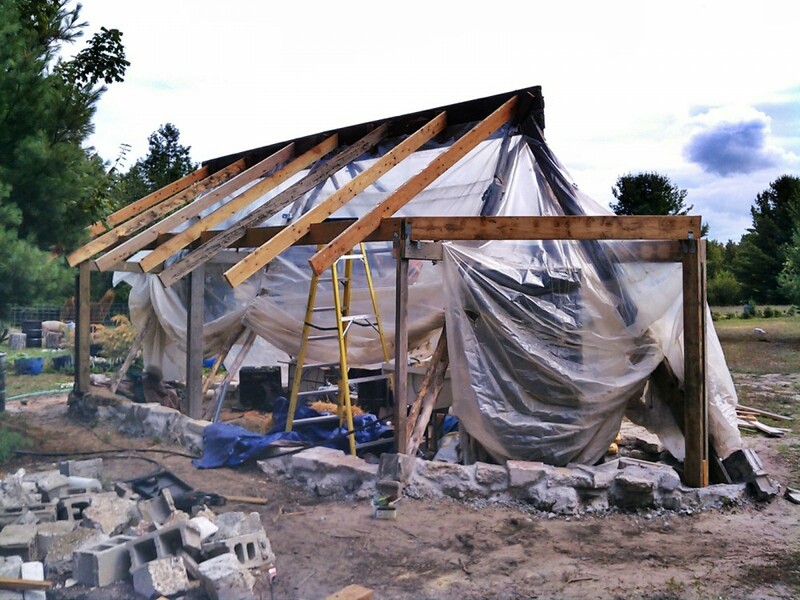 This whole experience was very reminiscent of the old amish “barn-raising” concept, but instead of it all coming together in a day, it would take weeks. And, unlike the Amish, we weren’t all neighbors living right next to one another. AND this was our first time trying this. 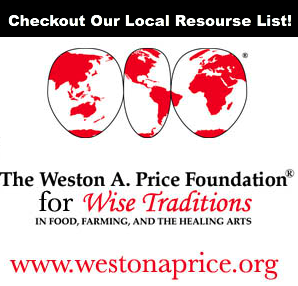 We didn’t have the benefit of growing up in a culture where this technique of construction was passed down from generation to generation. These aren’t excuses, I’m just pointing out some of the realities we faced to help you see past the romantic notion of a perfect group plastering project. 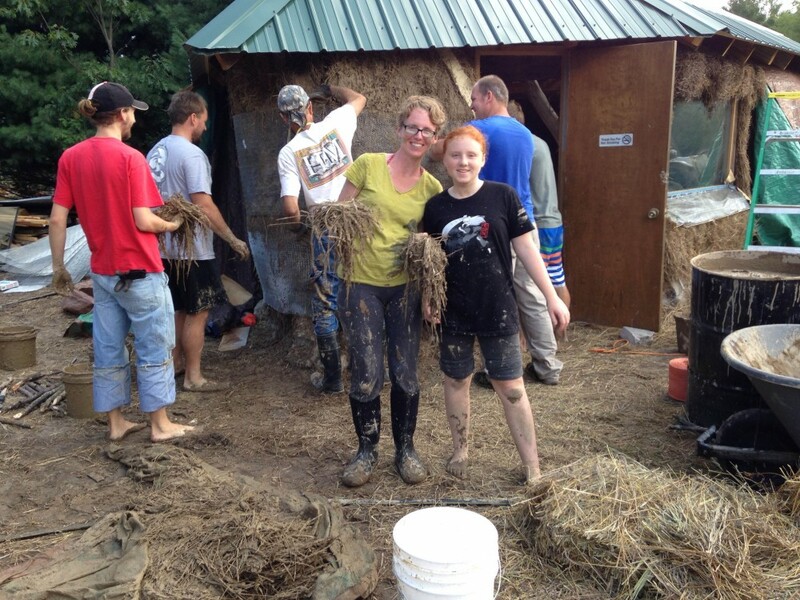 To be honest, as much as I LOVE the beauty and feel of earth plaster walls, and as much as I enjoy getting covered in mud with my friends…. For now, I’ll probably stick to wood-siding on my buildings because it’s a readily available local resource that I can install mostly by myself in a day or two. I’ll save the earth plaster parties and experimental building projects for a decade from now when we are settled into our home, with our homestead and gardens all buzzing along happily. But right now, our reality is that we have to prioritize RESULTS. These results should of course still be beautiful, economical, and ecologically responsible. And wood siding fits all those categories. 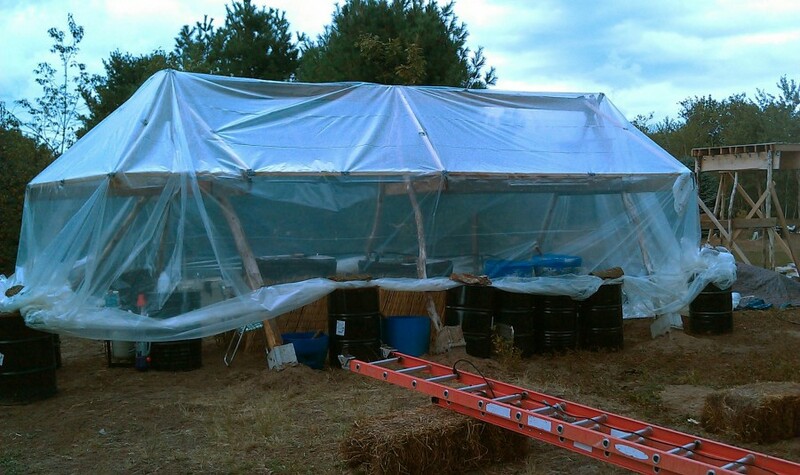 What has become of this strawbale greenhouse? 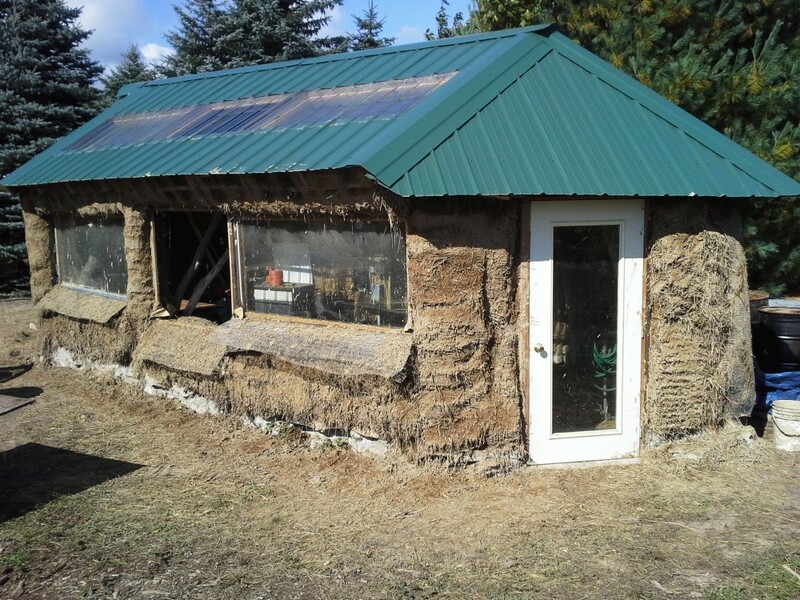 It still sits partly covered in earth plaster, but fortunately the roof overhang is large enough to keep the weather off it mostly so the HAY bales aren’t getting soaked and rotting. Also we haven’t had any issues with mice or other animals eating it away, so that’s a plus. I also went around with some old insulation and stuffed all the cracks and crevices, so when the door is closed the structure is sealed-ish. I’m sure there are some tiny holes here and there but it does a decent job holding it’s heat. The main thermal liability, and it’s a big one, is that the steel roof doesn’t have any insulation under it, so most heat is lost through it. Also the windows on the south facing wall don’t get enough light through them to grow plants inside, probably due to the thickness of the wall. 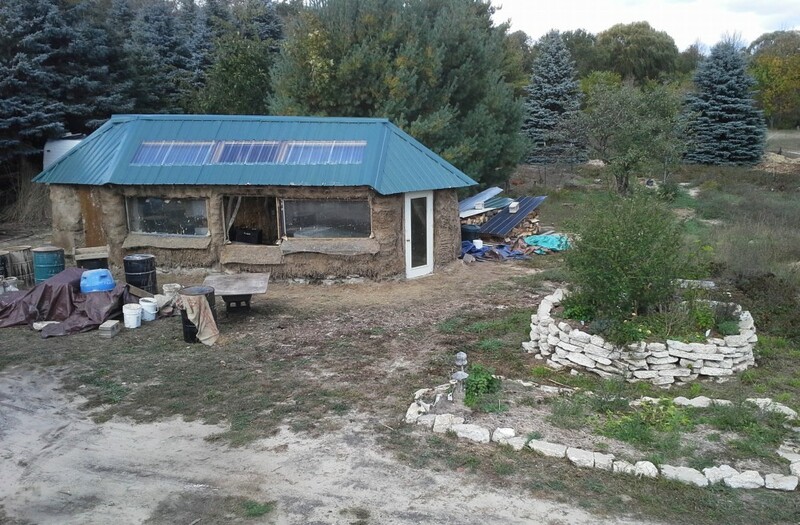 (as thick as a strawbale, er haybale) However, the window bar in the south facing roof lets a LOT of light in, so I put a long shelf right under that window, and that’s where we can fit about 18 flats of veggie seedling starts in the spring. It’s enough space for us for now because veggies aren’t our priority anyways, but I’m sure we’ll want to expand our seed starting space some day. For now the MAIN function of the greenhouse has actually become dry storage; IE It’s our BARN! It’s a great place to store tools, and random assorted items that we can’t fit in our tiny house. I’m happy with it, although I know that one of these days we need to finish the siding. But it’s just not a priority right now. It’s funny how priorities in one’s life change. Another good reason to not take on huge expensive projects before being really settled in and having a stable sense of priorities and a plan. In any case, the whole episode is now a warm collection of memories with friends, and important lessons learned. The symbol of these memories and lessons still stands today here at Realeyes Homestead, in it’s lopsided, beautiful, semi-functional state. A sort of art-installation that represents the collision of a dreamers dream with the real world. The dreamer is still here dreaming, and scheming more collisions. Only with a bit more refined approach. Much love goes out to all those who share the dream and are helping to realize it. What do YOU think? Have you had a similar experience? 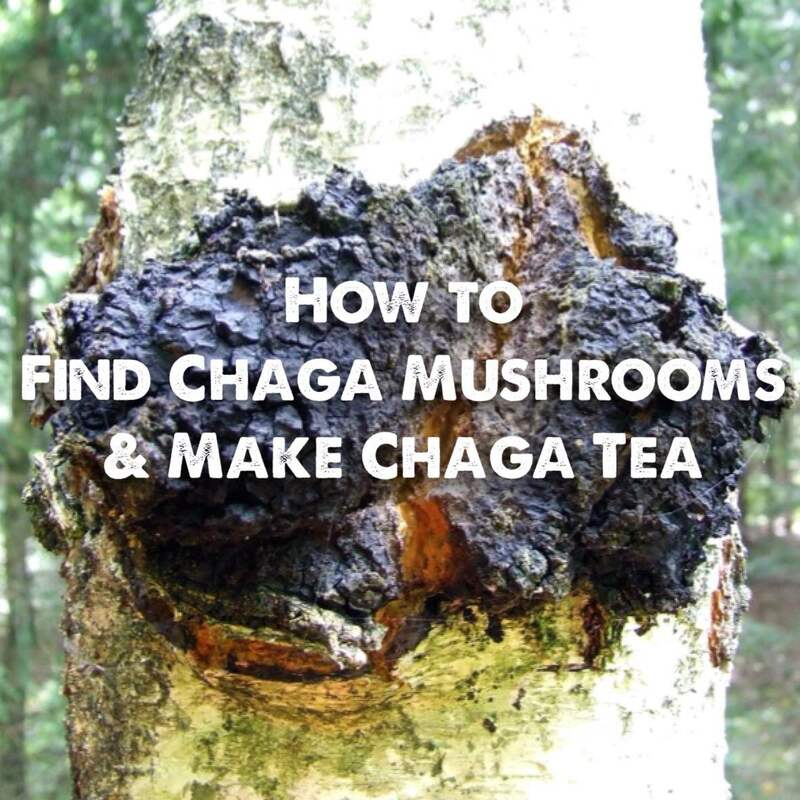 Do you have any tips or advise that would help us out? Then drop a comment to us down below. We love hearing from you all!